Nothing special here, just testing some cross ideas for the gallery. My wife makes crosses from fused glass to sell and being the gentleman I am, I’d though I would try and cut into her market. The first photo is redwood burl (veneer) with a walnut border. The second is bubinga. The center medallions are left overs from one of my hall mirrors. Those certainly are beautiful, simple…. maybe not so much. The only simple part of these is: “Simply Beautiful”! Really beautiful! How were the medallion made? Just beautiful says it all! The mirror project only needed four, so I went ahead an made a long strip of them in case I needed extras. Really beautiful! How were the medallions made? I’m studying it now, Thanks! You are entering an extended period of project silence, I’m getting nervous! Such a basic form as a cross, and you’ve taken it to the max. Between the woods used, and the etched medallions, you have mastered crosses IMHO. Loved the blog, very nicely done. Really like the crosses, thanks for posting. 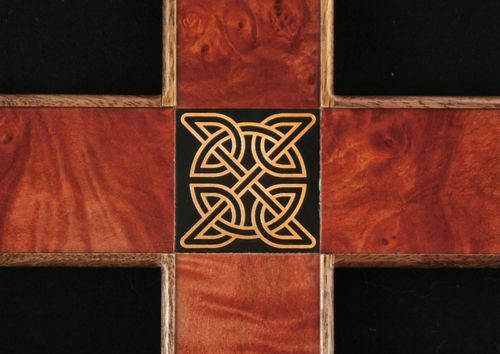 Beautiful inlay work. 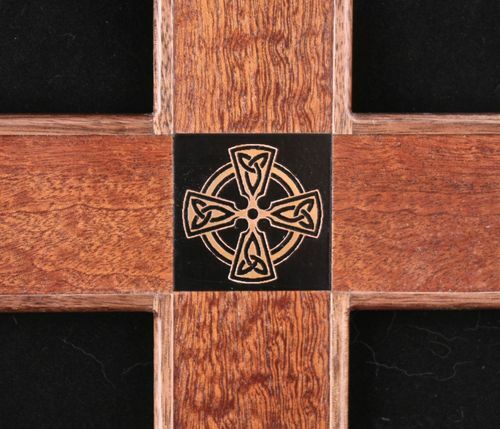 Love the Irish cross and knot.